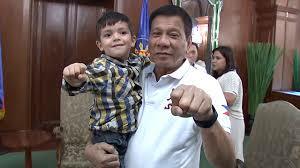 The 4 year old Brit-Fil young boy who was well known as a loyal supporter of President Rodrigo Duterte showed and was greeted by non other than the President himself in Malacañang Thursday morning . Ethan Richmond Llanes become a social media sensation when his mom uploaded a photo of him using a walkie talkie and is trying to call the before presidentiable Duterte. He lives in the United Kingdom with his family and even before election shows fascination to Duterte. 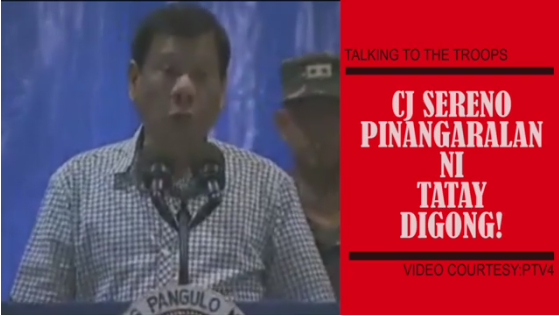 He was heard to asked the former Davao mayor to put the bad guys in jail and is persistent to see in person the President. 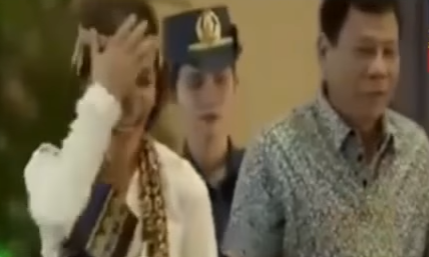 On August 25 Ethan and his mom went to see Duterte in his hometown in Davao but they were unsuccessful. A week later an invitation from the President himself was received by Ethan telling them to have a personal meet and greet. “This is Ethan my friend.. He was my good friend” Duterte quoted as he introduced the young fan to Malacañang and the media.They were seen playing peekaboo and The President remarked that Ethan will be a great guy someday. “Even the typically noisy little Ethan became shy and timid (for the first time). I asked him later in the car if he was feeling okay as he was rather quiet during the meeting with Tatay Digong. He said he was ‘very nervous’ as the President was ‘SO REAL,’” Ethan mom’s said.